A couple of days back i shared a post in eBook series where we learned Creating killer Title/Content for your ebook. Today we are back to the exciting topic i.e creating eBook 3D covers and finally exporting it into PDF format. Why PDF And Not Any Other Format? As i mentioned before, PDF format is universally recognized by PCs and Macs and thus its a wise move to get something out that would be usefully to the wide community. Plus, PDF is more consistent and gives much better result in terms of formatting. An eBook in .DOC file (Microsoft Document file) would give formatting issues when moved from place to place. Sending it through email might disturb the picture settings etc. With PDF, once its exported, its kinda final and thats what every body would see when the get it. One should really concentrate on the settings that he sets for his eBook. Exporting is one of the most important factor that we have to consider while we work out our eBook. The default zoom levels are to be considered wisely. Again there no set rule for the default settings. Normally 100-120% works for many people. View it to test out your final product. For settings Go to File >> Export As PDF and it would take you to the settings options. Choosing the right zoom levels would make sure that your final product (images) isn't blurry. There are so many 3D eBook cover creators online but the draw back is that most of them are premium services. There is a great solution that i have found as an eBook 3D Cover generator and the great part of the story is that they are free. Though i would recommend making out a great one for yourself (in case you aim to sell your eBook) as there are some limitations to these tools. There are limited number of templates that you could choose from. But for giving out free, they are worth using. It would save a lot of your time as your 3D cover can be few clicks away. Myecovermaker is my choice. The cover on right is what i made for the sample purpose. Its worth using (when we know that its free). You could upload your own images too. So finally export your PDF eBook and make sure its not a huge file. Working around 1MB is good enough. 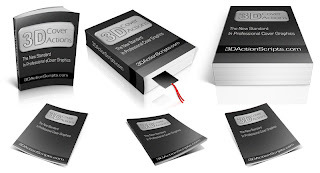 Once your PDF file and 3D cover is ready, its time to get to the publishing side. We'll look into that tomorrow.